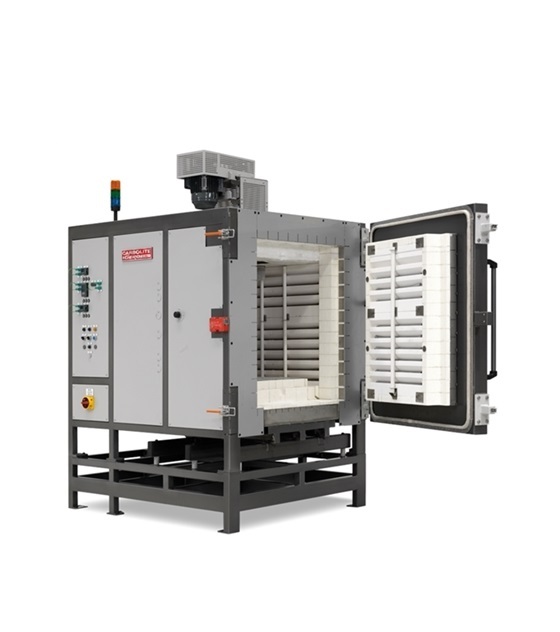 The robust construction of the Carbolite SBCF Static or Bogie Chamber Furnaces makes them ideal for applications such as the heat treatment of steels and alloys, ceramics sintering and aerospace heat treatment. The SBCF chamber furnace is an industrial scale furnace based on a modular design principle which can be adapted to various applications. The furnace chamber is cubic in shape and is available in three sizes. The furnace has a side hinged door and a fixed hearth. As an option the hearth can fitted to a bogie so it can be pulled out of the furnace on a track system. This hearth design technique also allows the furnace to be easily adapted to a vertical lift arrangement to provide an elevator hearth, in which case the door would become a fixed side of the chamber. Under hearth heating and free radiating coiled wire elements on four sides. This design provides the option of single and 3-zone temperature control and for applications demanding the best uniformity possible, such as AMS 2750E (this can be combined with an optional air circulation fan). The construction uses low thermal mass insulation materials to maximise running efficiency whilst using robust refractory materials where physical strength is required such as the loading area of the hearth. Silicon carbide (SiC) tiles are fitted on the hearth to provide a hard wearing surface.